The single most useful electrical property of plywood is its resistivity, or inability to conduct electrical current. Plywood is a highly effective insulator as long as it is dry. The resistivity is very sensitive to water absorption and drops drastically as moisture content increases. The glueline in plywood is not as effective an insulator as the wood itself. For applications in electric fields in the range of household voltages it may be neglected, but it could be important on certain test benches of sensitive electrical instruments. The mechanism of electrical conduction depends upon the presence of ions in the wood. In the moisture content range from 0 to more than 20 percent, the number of charge carriers becomes a major factor. The DC resistance of wood and plywood is approximately 1010 ohm per cm at a moisture content of 12 percent, and drops to about 107 at 20 percent. The alternating-current (AC) resistivity is considerably lower at high frequencies than the DC resistivity. For oven-dry wood in the transverse direction a value of 18 x 106 ohm per cm at 2 MHz has been reported. Moisture content affects the AC resistivity, but not as dramatically as for DC current. We're growing more wood every day. 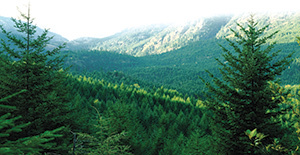 New U.S. Forest Service data reveals positive gains. Life Cycle Assessment shows wood is the greenest building product. Manufacturing wood is energy efficient.